We know that some DNA binding proteins are site specific, that is they recognise and bind to a specific nucleotide sequence. My question is how can we precisely tell at which sites they bind? Is it the amino acid sequence of the protein? Or is it the repetitiveness factor in case they bind to multiple locations on the chromosome? I will try to answer the question in the title: how can we know the sites where DNA binding proteins bind? I'll explain two experimental methods to identify binding sites on DNA. We can locate proteins bound to DNA by their ability to protect DNA from some degradation. DNase I cleaves DNA in an almost-random manner and is inhibited by proteins covering ('protecting') the DNA backbone. In order to locate a site which is protected from DNase I cleavage, we need to take some genomic DNA and treat it. We need separate, short lengths of DNA to examine - we can obtain these from genomic DNA by PCR amplification of different stretches. We need to label these amplicons at one end only, beta radiation is a good choice of label. Taking one labelled amplicon, exposing it to DNase I for a short time - not long enough for complete digestion - produces cleaved DNA of all possible lengths, which looks like a 'ladder' after separation by gel electrophoresis. Digestion time must be short, such that many DNA are only cleaved once, to have a complete ladder. Repeating this digestion with your interesting protein present gives a ladder with a missing segment. This is because your protein protects a length of DNA from cleavage. Important points: DNA is labelled at one end only. Hence we only see the label-end-piece of DNA after cleavage: if DNA is labelled 5' and cleaved in half, we only see 5' halves. Thanks to this, we can estimate the position of the binding site: if our DNA is 100bp and our ladder has lengths 0 to 70bp, a gap, then more from 85 to 100bp, then our binding site is somewhere inside 70-85bp from the labelled end. We can sequence the piece of DNA and read the sequence of nucleotides 70-85. This is a more recently-developed method, which is more suited to studying where a protein binds all over the genome or all over a chromosome. It requires an antibody which specifically binds your interesting protein. 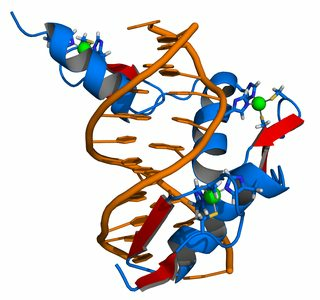 First, a 'snap-shot' of global protein-DNA binding is taken by irradiating cells with UV light, causing covalent cross-links between DNA and binding proteins. Chromatin (DNA with associated proteins) is isolated from cells and chopped up to smaller fragments; the cross-links preserve our 'snap-shot' of proteins and short lengths of their bound DNA. This mixture is incubated with an antibody (immobilised on beads) which binds our protein of interest. We can separate the antibody-covered beads and hence our protein along with it. Finally we can sequence the DNA fragments caught in this way. It's like "fishing for binding sequences". The end result is a distribution of where our protein was bound across the genome at the time of our snap-shot. Ideally the DNA fragments should be long enough to place them uniquely in the genome. There are advanced PCR and sequencing methods which separate DNA fragments in to 'bubbles' in an emulsion containing one molecule of DNA each. In this way, we can sequence all the variants that are present and by counting the number of sequences ('reads') of each type, we have a measure of the abundance of each sequence. This abundance is interpreted as the occupancy of the protein at different binding sites. Genome-wide studies of DNA binding have shown us that proteins are distributed around the genome. They have preferred binding sites but also have some affinity for similar sites, and spend some of their time bound to non-functional bits of the genome. Especially in mammals, a 'true' binding site isn't only (and isn't always) determined by having the highest affinity sequence, but also by being clustered with binding sites for other co-factors. This is because, in mammals, proteins often bind DNA, not solo, but as parts of large complexes which can interact with nucleosomes and which allow regulation of transcription or whatever else. My question is how can we precisely tell at which sites they bind? Is it the amino acid sequence of the protein? Or is it the repetitiveness factor in case they bind to multiple locations on the chromosome? So, we can tell at which sequences (and where in the genome, even with what relative occupancy) proteins will bind to DNA by experiment. You could try to guess where they bind from their structure, but the way we precisely tell, is by experiment. The amino acid sequence of a protein ultimately determines its folded structure, and there are many DNA-binding motifs or domains which appear in many different proteins. Some motifs bind the DNA backbone regardless of the sequence of bases, others bind specific sequences. So yes protein sequence and (thus) structure determines what sites a protein can bind (you can imagine a distribution of affinity for sequences, there will be a 'peak' sequence) - but again some proteins bind the DNA backbone non-specifically, and in mammals they often don't bind alone but within complexes. People have studied protein-DNA binding by engineering their own arrays of zinc fingers or TALENs, and also by engineering their own DNA binding sites, through a process of 'artificial evolution': selecting the strongest binders, mutating them, and repeat. These kinds of studies might come up with a sort of optimal 'binding code'. Not the answer you're looking for? Browse other questions tagged dna bioinformatics biotechnology or ask your own question.